When you think of resonance, you’re likely thinking of 2 electrons as a lone pair or pi bond. But radicals, or unpaired single electrons can also participate in resonance to increase their stability. 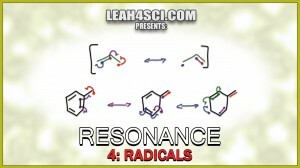 This is Video 4 in the Resonance Structures Video Series. Click HERE for the entire series.